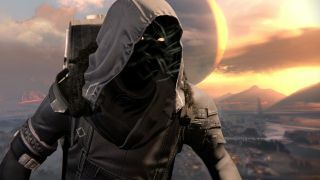 Destiny: Xur weapons, gear, and location, May 12 - 14. Hawkmoon and Zhalo Supercell! Xur, Destiny’s travelling weekend Exotic trader, zero-g plumbing specialist, and amateur – yet highly skilled – manufacturer of handmade wooden toys, is back. This week he’s in the Tower Hangar bar, where he’s been drunk and furious since 6am (time of day is relative when you’re constantly planet-hopping, an excuse Xur has been using for years). Someone is selling cheap knock-offs of his gear when he’s not around, and while it does an acceptable job, the build-quality just isn’t there. As much as anything else, he’s just annoyed with the buyers’ willingness to accept low standards in order to save a quick buck. He thought they were better than that. They’ll all be sorry when a child loses an eye. Anyway, what’s he selling? Well this lot. This lot is what he’s selling this week. What’s good? Well the Titans’ Immolation Fists are solid, gifting the Explosive Pyre perk for free, meaning that you can chain-kill with Hammer of Sol, and add the otherwise unavailable agility buff or target-tracking from the skill-tree. The Hunters’ Khepri’s Sting is decent too, granting invisibility when crouched, and buffing melee attacks to four times the damage when landed from behind while cloaked. Throw in additional melee damage over time, and it all adds up to multiple, crafty uses in the Crucible, and makes the Sting fairly handy for picking out tricky, stand-out enemies in PvE as well. And while they might not sound too exciting on the surface, the Warlocks’ Ophidian Aspect is a monstrously good set of Crucible gloves. Furnishing fast reload and quick switching on every weapon, as well as increasing the speed of the ridiculously rangey Warlock melee, and making Energy Drain more powerful, they present a gluttonous buffet of, well, buffs, that, if you’re solidly competent in PvP, will give you a hell of an all-round edge. As for guns? It’s all good stuff this week. The Zhalo Supercell (which seems to come up a lot now, in these decadent, loot-happy party days in the run up to Destiny 2) is an Arc-powered primary that can trigger chain-lightning on hit and charge your super – and replenish ammo - on double kills. A really tight, focused, and very harmonious set of perks, wrapped in a delicious, fizzing nonsense of a gun. And Hawkmoon is pretty delightful too. Not as powerful as it used to be in the days of its Year One notoriety, it’s still a strong – and fun – cannon. Massive impact, good range, and two different, stackable perks built around adding extra damage to random bullets (to a total of three in every mag). Tell me one thing that is not pleasant to read in that sentence. If you can, I’ll immediately show you an ungrateful swine. For it will be you. As ever, Xur will be around until 10am UK / 2am PT on Sunday, at which point he’ll be away for another week. He needs to make a swift trip to the dry-cleaners to get his tux ready for the Destiny 2 reveal on the 18th, so he’ll be away sharpish.